The Rudheath area of Allostock and Cranage including Woodlands Park, Shakerley Woods, BoundaryBarn and Rudheath Lodge was once a wild and lawless sanctuary for criminals. In early mediaeval times Rudheath was one of three Cheshire sanctuaries provided for criminals under the powers granted to the Earls of Chester. Rudheath Sanctuary used to stretch from the edge of Northwich through Allostock and Cranage to Goostrey. In this extensive wood containing swamps and thickets fugitives were allowed to live provided they paid a fine to the Earl of Chester and fought for him when called on. These were difficult times. 1349 saw the onset of the Black Death and in 1353 there was an uprising against the Black Prince, Earl of Chester and his officials. 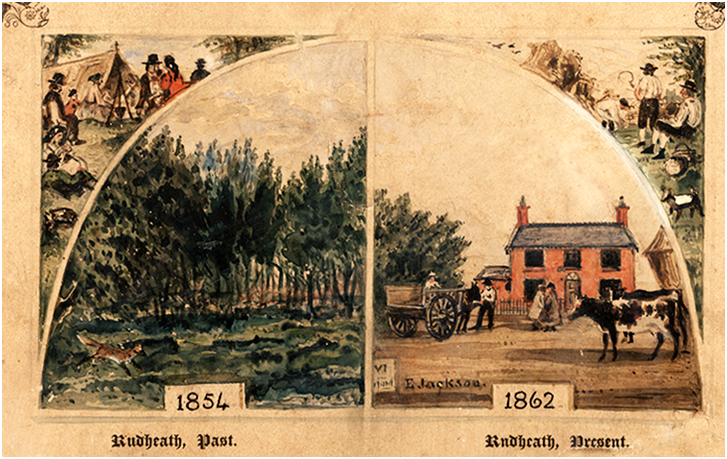 Rudheath was notorious for outlawry, murders and violence. Eventually “in consequence of grievous clamour and complaints ---of many robberies and murders” an act of parliament was passed to prevent “outlawry” and impose “forfeiture of goods”. Even after this, areas of Allostock and Cranage bore a bad name as wild and lawless places. In May 1644, Prince Rupert with 10,000 men camped on the great remaining spaces of Rudheath, Knutsford Heath and Bowdon Downs. 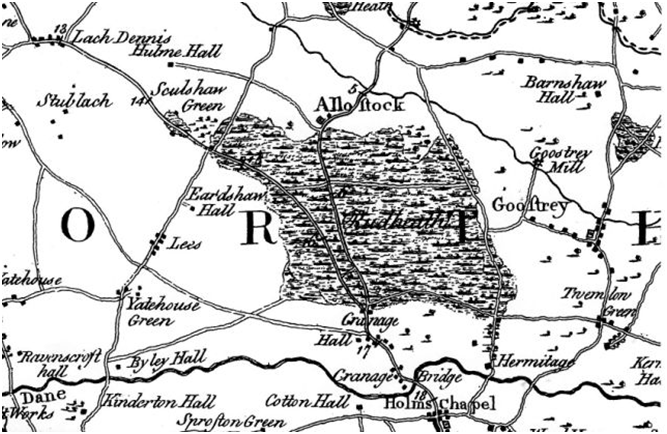 By 1777 Burdett’s map shows the Rudheath woodland in Allostock and Cranage had been much reduced by enclosures. Alan Garner’s novel “Red Shift” is partly placed in the once lawless heathland waste in Allostock where Woodlands Park is today.